Like other watches in the Edox Yachting Spirit Collection, the Women’s Classe Royale Ultra Slim features a multi-part case construction, which is quickly discernible by the two-tone bezel composed of brushed and polished steel. Indeed, the watchmakers at Edox know that good design is not something that comes together haphazardly and that details cannot be left to chance. The elements chosen in the design of the Classe Royale Ultra Slim are expertly married to enhance the watch’s composition, stylishness and exclusivity. This case width, for example, is a pleasing 32 mm, but it is the watch’s thinness that even the most discreet or particular woman will appreciate. The Classe Royale Ultra Slim is a mere 5 mm thick, hence the name. This low profile is not only practical for daily wear, it makes for an easy transition to more formal wear when an evening out is in store. The dial is well conceived. The solid white background of the central rectangular space makes it easy to read the time: the hour hand is completely inside the white space while the minute hand extends slightly outside of it overlapping the hour and minute markers. The date window sits neatly at 6 o’clock. Outside of the white central rectangle are elongated hour and minute markers that extend from the edge of the rectangle to the bezel. The overall effect is that of a starburst, which is superbly integrated into the construction of the multi-part bezel. A large Roman numeral 12 marker acts as the focal point of the dial and its stretched appearance is cohesive with the energetic tone of the design. Choosing the right strap for such a thin watch is essential. Edox selects white calfskin and a pin buckle, which not only matches the dial, but enhances the watch’s lively vibe, too. 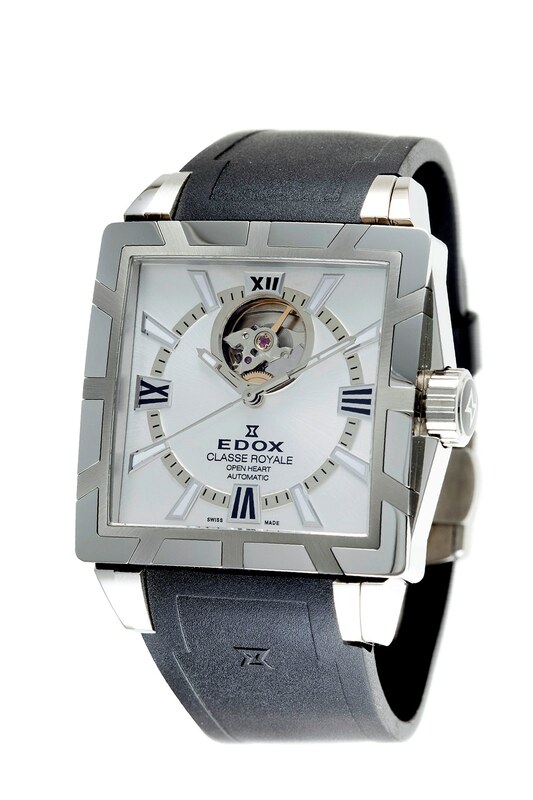 The buckle and strap are initialized with the Edox name, which is also engraved in the solid caseback. The fluted and initialized crown, with the Edox hourglass logo on a black surface, is suitably petite to match the thinness of the case. A stainless steel case and antireflective sapphire crystal keep the thin Swiss made quartz movement in this timekeeper water resistant to 99 feet. Looking for good form and style in a case that is far from run-of-the-mill? 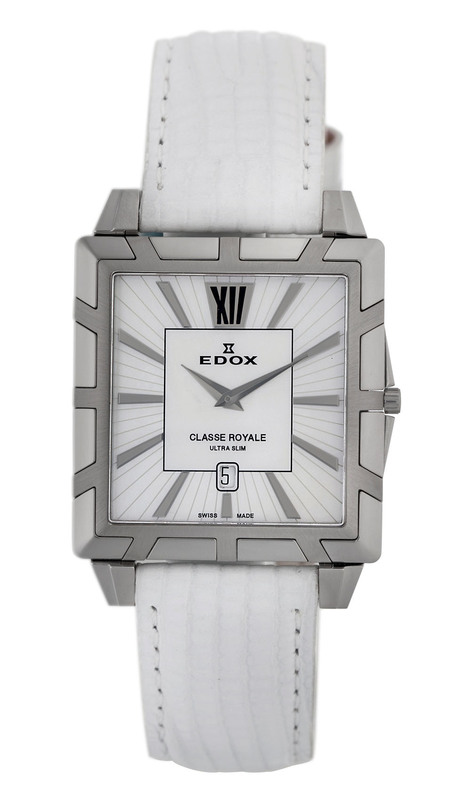 Look no further – these are hallmarks of the Women’s Classe Royale Ultra Slim by Edox. Square and rectangular watches have been around for decades, yet they continue to captivate watch lovers with their pleasing discordance; that is to say, the round nature of an analog clock does not intuitively fit into a square space and thus creates an unusual juxtaposition. But when the details and proportions are aligned just right, as they are with the Classe Royale Men’s Open Heart Automatic by Edox, the reward is a design that is both uncommon and abundantly appealing. Classe Royale models are part of Edox’s Yachting Spirit Collection, a theme that conveys the stately and nautical qualities of sailing. The men’s automatic shown here features elements that speak to these values. The case construction is a real stand-out: the complex, multi-part 40 mm stainless steel case instantly identifies the watch as an Edox. The crystal is made of sapphire and the two-tone bezel finish, made up of brushed and polished steel, demonstrates watchmaking sophistication. Long, gently angled crown protectors flank the fluted crown, which is initialized with the Edox hourglass logo on a black surface. 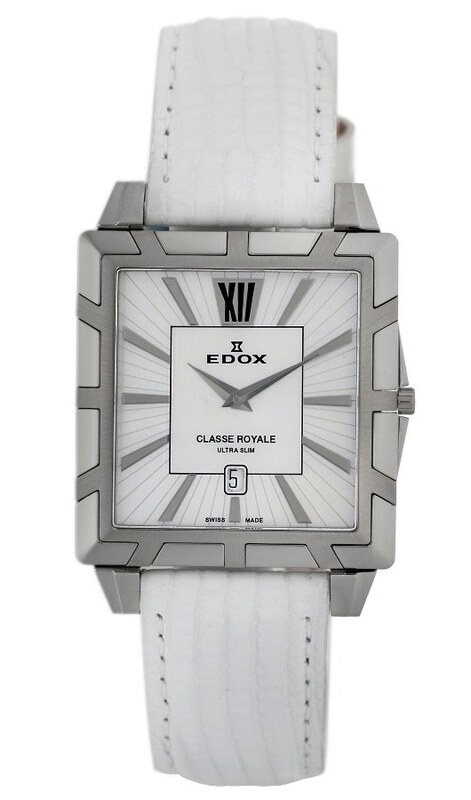 Another outstanding design element of this Classe Royale model is the way in which Edox unites the dial and case using the hour indices, which all intersect the circular minute track at one end and extend out to the flange, where, their shape is echoed in the brushed-steel sections of the bezel. The dial’s silver surface features a sunburst pattern and stylized Roman numerals at 12, 3, 6 and 9. The centrally mounted hands are partially skeletonized and coated with luminescent paint, as are the hour indices. Silver and black accents complete the dynamic look. Even with these details, the highlight of this Classe Royale is the presentation of the movement from both the front and back. On the dial side, a circular aperture (called the “open heart”) reveals the watch’s balance: visible are the balance wheel and spring, the large central jewel of the shock absorber and a glimpse of the escapement – the marvelous combination of parts that manage energy output and keep time. On the caseback, a second window offers a glimpse of the customized rotor and other components. The movement on display is an ETA 2824, one of the workhorses in the ETA stable. From a watersports point of view, the Classe Royale offers water resistance to 165 feet. The watch is mounted on a fitted black rubber strap that is completed by a well-designed double-folding clasp. The Classe Royale Men’s Open Heart Automatic offers exceptional value for those with a taste for the avant-garde, and for anyone who appreciates seeing the vital components that make a watch tick. The Edox Classe Royale Big Date Chronograph is simply spectacular. 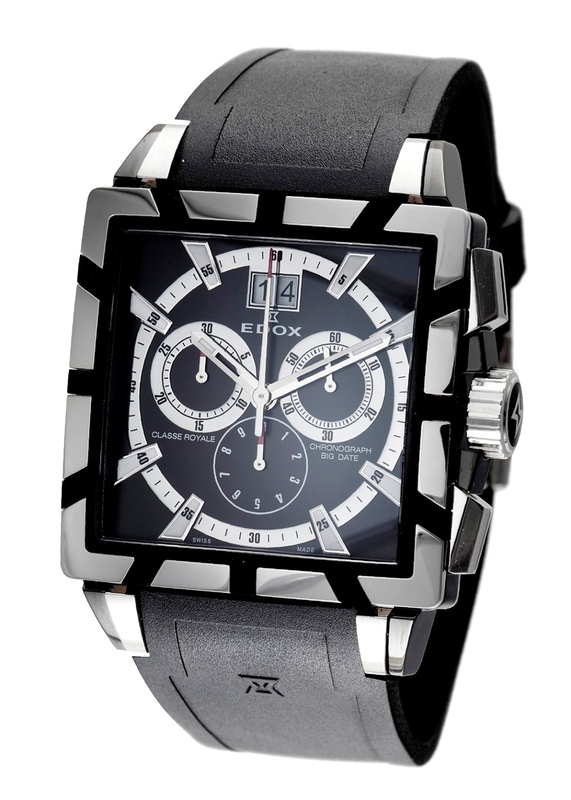 With its oversize, 40 mm square case and bold black and silver motif, this is definitely a timepiece that commands attention. The strikingly attractive appearance of the Classe Royale Big Date Chronograph is one reason this watch was featured prominently in Looper, the new science fiction action film by Rian Johnson. The Classe Royale sets itself apart from the crowd with a unique multi-part case construction and two-tone bezel. This stylishly functional chronograph features three well-placed sub-dials for timing virtually any event. Partially skeletonized luminous hands ensure that all dials can be easily read at any position and an extra-large date indicator at twelve o’clock makes the date readily available even under poor lighting conditions. With styling reminiscent of classic yachting designs, the Edox Classe Royale Big Date Chronograph will add a touch of class to any wrist. This is no ordinary yachting watch however. From the stylish rectangular stainless steel pushers flanking the crown, to the raised indices radiating outward towards a corresponding two-tone bezel, this is a chronograph for the 21st century. The Edox Classe Royale Big Date Chronograph is powered by a precision quartz movement and has been equipped with a stylish black rubber strap. 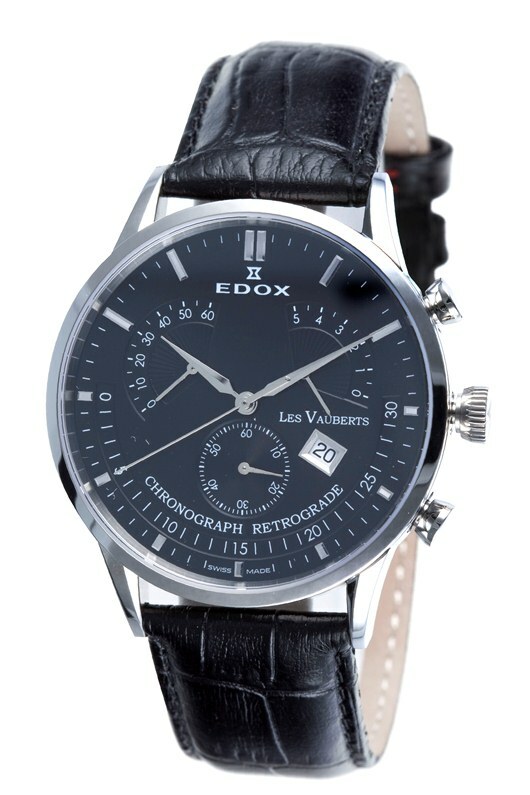 This dependable timepiece is water resistant to 165 feet and comes with an Edox 2-year warranty. For over 125 years Edox has been producing precision Swiss made timepieces that continue to set new standards for innovation and excellence. This passion for perfection has already caught the attention of the sports world and of Hollywood. With eye-catching designs like the Edox Classe Royale Big Date Chronograph, there’s a good chance that Edox will catch your attention as well. To put one of these spectacular chronographs on your own wrist, contact an authorized Edox dealer today. If you’ve never experienced the joy of using a retrograde chronograph for yourself, you’re in for a treat with the innovative Edox Les Vauberts Chronograph Retrograde. Unlike a traditional chronograph, the primary chronograph hand on this spectacular timepiece rotates counterclockwise, resulting in an intuitive and easy to understand way to measure events of up to one hour in length. Every 30 seconds, the chronograph hand returns to zero and repeats its retrograde motion, while incrementing two retrograde subdials that measure longer time intervals. The whole process makes so much sense when you see the watch in action (video below) that you’ll wonder why all chronographs aren’t designed this way. It’s no surprise that a watch like this comes from Edox. For over a century Edox has been a horologic success story, with a long list of innovations that remain unrivaled to this day. The exquisite 41mm stainless steel Les Vauberts Chronograph Retrograde brings this tradition of leadership and innovation to a new generation of watch aficionados at a surprisingly affordable price. The Les Vauberts Chronograph Retrograde is powered by a precision Swiss made quartz movement and is water resistant to 165 feet. 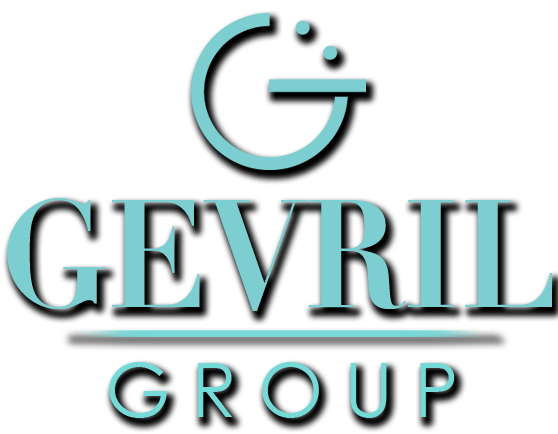 The watch, which is manufactured and assembled in Switzerland, features a scratch resistant genuine sapphire crystal and is equipped with a luxurious calfskin band. There is a convenient date window at 4 o’clock and along with a small continuous second hand at 6 o’clock. 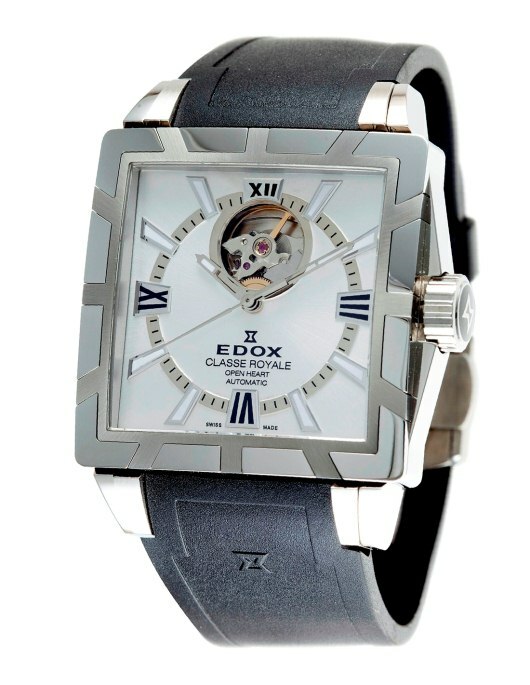 The stainless steel crown is adorned with the iconic Edox hourglass logo. This elegant and sophisticated timepiece is equally at home in casual or dressy situations. With its unusual retrograde complication, this is definitely a watch that will garner attention wherever you wear it. If you’d like to see one of these innovative beauties on your own wrist, be sure to contact an authorized Edox dealer today and reserve your Les Vauberts Chronograph Retrograde immediately.